Our month of character intro themed favorite scenes continues! Will from Exploding Helicopter did the honors this week. 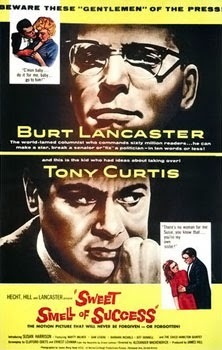 Sweet Smell of Success (1957) is one of the darkest films ever committed to celluloid. Set amidst the apparent glamour of the entertainment industry, it depicts a corrupt parallel world. One where illicit favours are the only recognised form of currency. And the rotten black heart at the centre of it all is Burt Lancaster’s J.J. Hunsecker. Lancaster plays a newspaper columnist and broadcaster with the power to make or break careers. A megalomaniac control freak, Lancaster is blackmailing press agent Sidney Falco (Tony Curtis) to break-up his sister’s relationship with a young jazz musician. Until the romance is ended, Curtis is unable to earn a living as his clients won’t receive any media coverage. We learn these details in a series of scenes that open the film. Having established Hunsecker’s malign power we’re finally introduced to the man himself. The scene begins with a quick demonstration of Lancaster’s authority. After Curtis approaches, Lancaster commands a bouncer to remove the uninvited guest from the nightclub. Acceding from his demand, Curtis is ultimately allowed to sit down, but he’s tucked behind Lancaster’s elbow like an attentive flunkey rather than equal. It’s clear who the man in charge is. This command is emphasised by director Alexander Mackendrick’s camerawork. Throughout the film he photographs Lancaster from low angles making him dominate the frame in a way that mirrors his dominance of the characters around him. Traces of that can be seen here. Lancaster is subtly foregrounded in several shots making him appear more important than those around him. This is reinforced in small details that again occur through the film. In this scene Hunsecker holds what appears to be an impractically small pencil. This appears to be an active choice on the part of the filmmakers, as later we see Lancaster dining in a restaurant with absurdly small cutlery. It all seems designed to suggest that Hunsecker is bigger than everything and everyone around him. Lancaster’s ruthless modus operandi is wickedly delineated as he dismissively deals with a brutally brief phonecall from a comedian. When he recounts a joke that Hunsecker has already printed in his column he is, in Sidney’s words, “condemned to death”. The perceived insult is compounded when the promoter Manny Davis makes the mistake of laughing as the punchline is repeated. Lancaster’s cold steely glare betrays his cold anger, and he maliciously starts to expose Davis’ scheme for promoting the ingénue he’s touting. The senator makes a doomed attempt to change the topic. But this simply allows Lancaster to turn his fire on Curtis, carving up his character like a stiletto wielding assassin. Aware he’s engaged in a battle he can’t win, Curtis makes a tactical retreat. But not before he’s helped establish Lancaster as a demagogue who expects no-one to challenge the rule of his domain. What's your favorite scene from Sweet Smell of Success? You should put it on your 'to watch list'. The film drips with acidic one-liners. Beautifully photographed too.